Botanical Name: Lophatherum gracile Brongn. (Fam. Gramineae). Common Name: Lophatherum, Lophatherum Herb. Part Used & Method for Pharmaceutical Preparations: The leaves are gathered in summer, dried in the sun and cut into pieces. Chemical Composition: It contains triterpenes and steride, etc. Meridians: Heart, stomach and small intestine. Functions: 1. To clear heat and benefit urination; 2. To clear heat in the heart and lessen irritability. 1. Febrile diseases manifested as irritability, thirst and fever. Lophatherum (Danzhuye) is used with Gypsum (Shigao) and Anemarrhena rhizome (Zhimu). 2. Heat in heart, stomach and small intestine manifested as ulcerations of the mouth and tongue and scanty, painful urination. 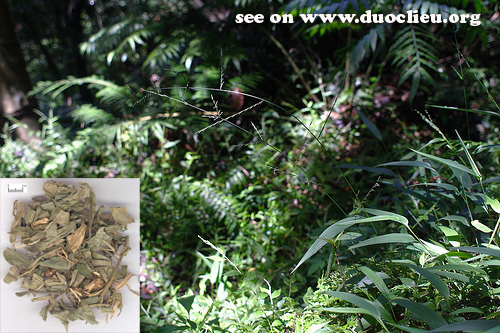 Lophatherum (Danzhuye) is used with Fresh rehmannia root (Shengdihuang) and Clematis stem (Mutong). Cautions & Contraindications: The herb should be used with caution during pregnancy.